Glasgow, Aberdeen and Edinburgh universities have become the latest organisations to quit the CBI. It comes after the business lobby group registered with the Electoral Commission as a backer of the pro-Union campaign in the Scottish independence referendum debate. Glasgow University said it had to resign its membership in order to "maintain impartiality". Aberdeen University said it would be inappropriate to continue as a member. Edinburgh University has also left the CBI said it had a "strictly neutral position" on the issue. Robert Gordon University in Aberdeen said it was not resigning from the CBI (Confederation of British Industry) but that it remained "strictly neutral" on the referendum. CBI director general John Cridland has been defending the decision to register with the Electoral Commission. He told the BBC he did not think the economic case for Scottish independence had been made, but said the body was not seeking to influence how people voted in the referendum. Over the weekend, Scottish Enterprise, Visit Scotland and STV left the CBI. The Scottish government said it was "clearly inappropriate for government agencies to remain in membership of CBI." CBI Scotland's registration with the Electoral Commission as a non-party participant allows it to spend up to £150,000 on referendum campaigning during the regulated period from 30 May until the referendum on 18 September. Following its decision, Scottish firms Aquamarine Power and the Balhousie Care Group announced they were quitting the business industry organisation, which is the leading body in the UK representing large employers. A spokesman for the University of Glasgow said: "As an institution we have a strictly neutral position on the independence debate. "We have carefully considered the decision of CBI Scotland to register with the Electoral Commission and decided that in order to maintain our impartiality we must resign our membership forthwith." A University of Aberdeen spokesman said: "The university does not take an institutional position on the constitutional future of Scotland. "We believe that the role of a university is to inform the public debate through the contribution of its academic and research expertise." A University of Edinburgh spokesman said: "While the University of Edinburgh hosts debate from all sides in the discussion around Scottish independence, we have a strictly neutral position on the issue as an institution. "We have therefore withdrawn from membership of CBI Scotland while they are officially backing one side in that debate." A spokesman for Robert Gordon University said: "The purpose of the university's membership of the CBI is to assist in developing links with potential business partners. Such memberships are reviewed annually by the principal, in discussion with senior university officers. "The university is strictly neutral in relation to the independence referendum, and does not approve of the CBI statement. However, we are not in the CBI in order to address Scottish independence." Dundee University is reviewing its CBI membership at a meeting later this week, a spokesman said. CBI director general Mr Cridland told BBC Radio 4's Today programme: "The members of the CBI want the CBI to have a view, and that view is that it is a matter for the Scottish voter. "We are not trying to campaign to influence the Scottish voter but we are a business organisation and on the business issues - jobs in Scotland, growth in Scotland, living standards in Scotland - we have a view. We don't think the economic case for independence has been made and we think the economy in Scotland and the economy of the United Kingdom is stronger together. "We are not taking actions in an election but we do have a point of view." Defending the move, he said: "We have to operate within the law and the decision we took was that simply to do our normal activities on behalf of our members, including events and public statements between now and the referendum, we were advised that we needed to comply with the Electoral Commission's rules because we have a position on the issues. "It is a compliance issue." Mr Cridland expressed regret that some members had taken the decision to leave the CBI. He added: "Nothing changed this weekend about CBI's position on the issue." 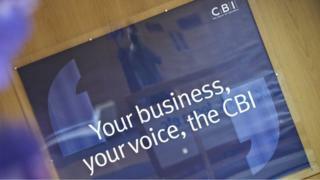 Balhousie chairman Tony Banks said the CBI took the decision without consulting its members. He has challenged the organisation to produce evidence that it has followed due democratic process. Mr Banks, who chairs the pro-independence group Business For Scotland but has said his firm is "neutral" in the independence debate, said: "The CBI declaring for the 'No' campaign has put us all in an untenable position." "To maintain our neutrality we have to resign from the organisation." Speaking on BBC Radio Scotland's Good Morning Scotland programme, he added: "They believe they have a mandate from the council of CBI Scotland but I have spoken to council members who cannot remember this being discussed or voted upon. "I would actually challenge the CBI to produce minutes and evidence of the fact that they have gone through a democratic process to come to this decision. "Businesses are now taking their time and reflecting on this decision, and when business is back to normal on Tuesday I'm sure we're going to see a number of other resignations from CBI Scotland." Other CBI members, including Glasgow Caledonian University, are expected to consider their position later this week.